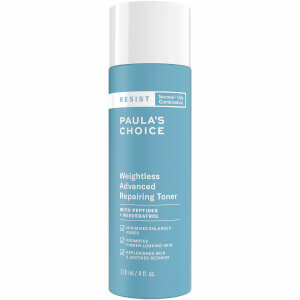 Paula's Choice Resist Advanced Replenishing Toner is an anti-ageing toner formulated to calm, smoothen and restore a radiant complexion, without over-drying or uncomfortable tightness. Suitable for all skin types, its unique milky texture is infused with a cocktail of antioxidants to repair sun damage and prevent signs of ageing, whilst addressing uneven skin tone, reducing the appearance of wrinkles and improving skin texture. Ultra-soothing, the toner is ideal for those with redness or dry, flaky areas. E.N. After cleansing, apply toner to a cotton pad and gently stroke over face and neck. Do not rinse. Follow with the rest of your morning or evening skincare routine. For daytime, finish with a broad-spectrum sunscreen rated SPF 25 or greater.